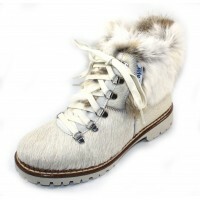 Pull on boot with front lace ornamentation. Warm lining throughout. Rubber platform sole. 1 1/2 inch heel. Made in Italy.